As worldwide demand for Novo Fogo organic cachaça increases, we must confront a serious question: how can we expand our capacity for growing sugarcane without harming the environment or depleting the land’s resources? We’re a cachaça producer, but fundamentally Novo Fogo is an agricultural business, practicing sustainable farming methods in the most precious of landscapes. The Atlantic Forest surrounding our sugarcane plantation in Morretes is a natural asset that allows us to grow such clean, organic cane. What remains of this magnificent jungle, which has been deforested by over 85% over the years, must be respected and preserved — after all, it’s home to over 2,200 species of animals and 20,000 species of plants (8% of the world’s flora)! Clearing the forest for more cropland would be antithetical to our values and against the law. Moreover, our organic agricultural business is on the front line to bear the consequences of a changing global climate. In the last year we have already observed more extreme weather than in the past: higher-than-usual winds and rainfall take a toll on our cane fields and can lead to lower yields. As organic cane farmers, we’re subject to the unpredictability of Mother Nature. The question persists: how do we grow for the future? The solution we found is a meaningful one, and it involves expanding our sugarcane fields without having to plant more sugarcane in Morretes. Novo Fogo’s master distiller, Dr. Agenor Maccari, Jr., is an agronomist and distillation scientist who has mentored numerous cachaça distillers in Brazil. By coaching these small-scale producers to farm organically and distill methodically, Agenor has worked to keep the 500-year-old tradition of artisanal cachaça production alive. This is a good thing for Brazil. In 2017, we will start introducing into the Novo Fogo line some cachaças produced in the western end of Paraná, near the city of Foz do Iguaçu, produced by two of Agenor’s closest mentees and collaborators. These USDA-certified organic distilleries utilize the same equipment and methods as we use in our Morretes mothership, with Agenor monitoring the cane cultivation and distillation on a regular basis. 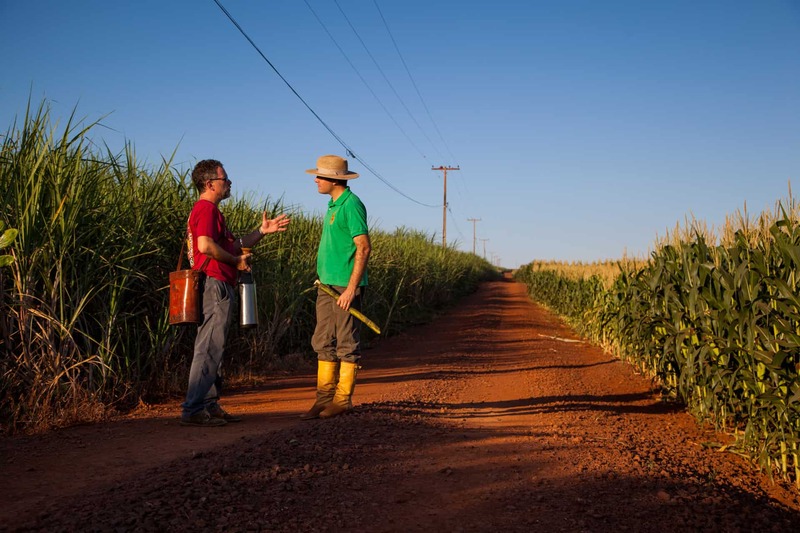 Dr. Agenor Maccari, Jr. talks with Itamar Menegotto between a field of organic sugarcane on the left and a cornfield on the right. Agenor sips on chimarrão (erva-mate tea) and Alessio Menegotto shows him his time-worn favorite machete. 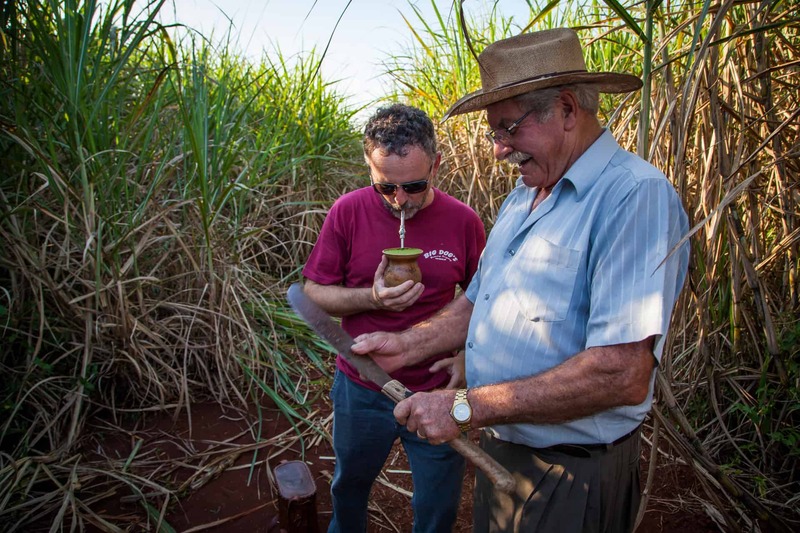 Agenor teaches these family producers about the Novo Fogo approach to making cachaça: growing USDA-certified organic sugarcane, fermenting the raw cane juice with wild yeast to develop specific chemical compounds, and distilling to capture only the best part of the spirit. This collaboration has yielded a cachaça that is a strikingly similar complement to the cachaça we produce in Morretes. After we mix and rest the distillates, the result is a USDA-certified organic cachaça that we are proud to call Novo Fogo. Ultimately, these partnerships have allowed us to increase our capacity for producing cachaça in a way that prioritizes sustainability, quality, and consistency. 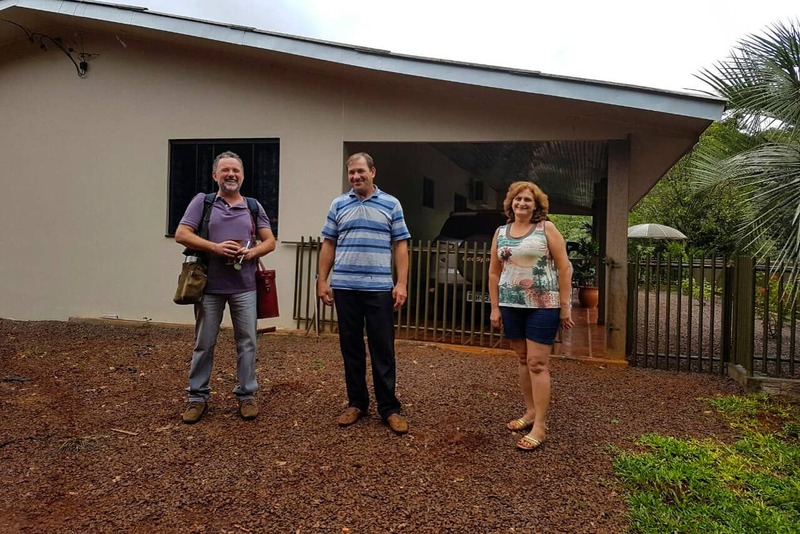 And equally important, this partnership opens a new door for us to empower small family businesses in Brazil to produce cachaça the right way. By teaching organic farming, waste recycling, and employing fair labor practices, and giving them the opportunity to become financially successful, we are helping them become role models in their own community. This approach is sustainable, scalable, responsible, and it embodies Novo Fogo’s mission of doing well by doing right. 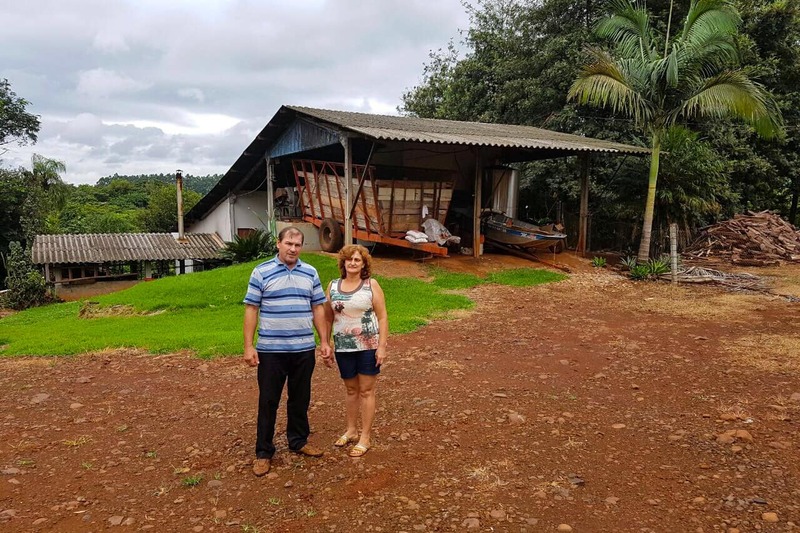 Davi and Dalva Gurski own a small family farm and cachaça distillery in western Paraná state. Agenor at the Gurski family distillery with erva-mate in hand.